What does it mean to “take the Lord’s name in vain?” As the fourth of the ten commandments, we have been taught since an early age that we are never to take God’s name in vain. Although the NIV Translation of Exodus 20:7 (see above) clears up the meaning somewhat, most of us still have a false picture of what God was saying when He gave Moses this commandment on Mount Sinai over three thousand years ago. The answer lies in understanding the middle eastern culture that was present in Bible times. In the ancient Hebrew culture your name was not just your title. It was a description of who you were, your identity, your character, your reputation, your authority and ultimately your destiny. For example, the name Moses meant to “draw out” and tells not only of His being taken out of the Nile as a baby, but also taking the Israelites out of Egypt. See also the story of Hannaniah, Mishael, and Azariah and Perez. The Bible is full of examples of characters names that live out their names in their life stories. Your name affected the way you lived and acted and it was paramount that your name was given respect and honor. God’s name is the same way. His name reflects His character, reputation and authority. The Lord’s prayer says that we are to “hallow His name”. The word hallowed means to “make holy or sacred, to be revered.” We hallow or honor God’s name by accepting and doing His will (thy kingdom come, thy will be done). The opposite of not honoring God and not doing His will is to take His name in vain and not to give it respect. It is not just using bad language or using His name in an oath or swearing. If we have accepted Christ as our savior, He has given us His Name. The Bible talks about it in marriage language. We are the bride of Christ (Revelation 19:7 and others) and God is our husband (Isaiah 54:5 and others). In the same way that a woman takes on the married name of her husband, God has given us His name. It is now part of our character, our reputation and our destiny. We are privileged and honored to have been given God’s family name. We don’t want to give our husband a bad name or tarnish the family reputation in any way. To take the Lord’s name in vain would be to misuse it, defame it or bring shame to the name he has so graciously given us. We degrade His name by being a bad example of what the family name is like. We are to hallow and make holy God’s name and our name. We make His name holy by increasing His honor, increasing His reputation, increasing His glory and by making His identity known. Our challenge is to not mess it up, to not ruin His reputation, but to bring honor to His name by the way we act and live. The Fire is in the Book! A common question that is asked when we see someone who is passionate about their faith is, ”How do I get that same fire in my soul? How are they able to have such passion and such fervor for the things of God?” Most of us struggle to maintain our passion and to discipline ourselves in our Christian walk. We want to know how to get that fire and to keep that fire burning inside us for the long haul. The answer is always in the Text (see above verses). The fire is in the book! As we study and wrestle with the words in the book and commit them to memory, we begin to develop that fire in our chest. There is no substitute for the hard work it takes to become a disciple that has passion for the Text. The fire is there in the Book; it has always been there. As you seriously read the Text, you begin to develop the hunger that eventually becomes a consuming fire. There is no shortcut to developing the fire. You can’t go to a weekend seminar and learn the three steps to obtaining it. The disciple has to do the hard work of taking the Word in and then walking it out and being obedient to it. It will be the hardest thing you have ever done, but think of the reward! I continue to be fascinated by the fact that the whole Bible is really just one interwoven story. 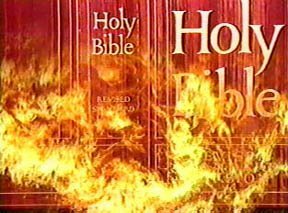 The Hebrew (Old) Testament continually surfaces in the stories in the gospels and conversely the stories in the gospels are foretold and prophesied throughout the Hebrew Testament. One unbelievable example of this is found in the similarities between Moses’ trip up Mount Sinai in Exodus 24 and Jesus’ experience on the Mount of Transfiguration in Matthew 17 (also found in Mark 9 and Luke 9). Let’s take a look at these two stories and see if possibly Jesus, the second Moses, was emulating and fulfilling what had happened to Moses himself during the Exodus. At this point it would be helpful if you took the time to read all accounts of both stories. In both stories three men go with the main character. Moses takes Joshua, Aaron and Hur and Jesus takes Peter, James and John. In both cases, a cloud covered the mountain. In Exodus 24:16, it says,”For six days the cloud covered the mountain, and on the 7th day the Lord called to Moses. In both Matthew and Mark, the gospel writers are careful to tell us that it was six days that Jesus took the disciples upon the mountain. In both stories nothing happened for six days and then on the seventh day, God spoke. The Hebrew word for settle is “shakan” (Strong’s 7931) and means, ”to settle temporarily or to tent, or abide in a temporary dwelling.” Is it possible that Peter realized that Jesus was reconstructing the Moses story? Is he thinking, “What can we do to bring shakan like the Moses story?” So he says, “Let’s build something temporary (like shakan) – let’s put up some tents to duplicate the Sinai experience.” In Hebrew, the word mishkan, a derivative of shakan is used to say tent or tabernacle. Shakan is also where we get the word Shekinah, to mean God’s glory, or the divine presence. Peter wasn’t just trying to think of something to do, he knew the story! Luke adds a wonderful exclamation point in his account of the transfiguration. It says in Luke 9:31, ”They spoke of his departure”. The Greek word for departure is “Exodos” (Strong’s 1841) and when “Exodos” is used in the New Testament, it is almost always used in conjunction with the actual Exodus story. The use of this Greek word wonderfully links Jesus death and resurrection with God rescuing his people out of Egypt. 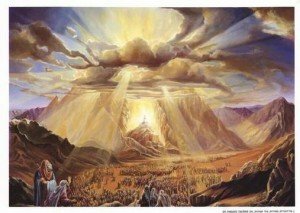 This comparison of Mt Sinai with the Mount of Transfiguration is just another convincing proof that the Bible is one long thread that is intricately and brilliantly woven together. We just have to look for the connections.